People are comfortable using branded mugs and water bottles and they use them a lot! Drinkware is also super versatile – it’s great for both men and women and also for the home, office and on the go. 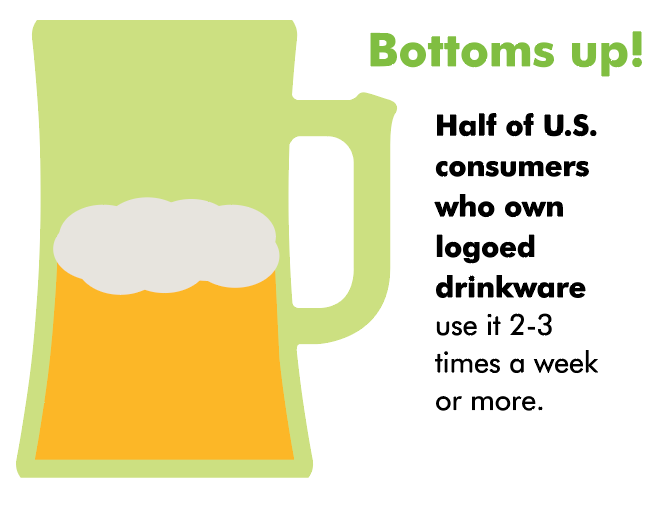 Drinkware has been one of our top-selling products for years. Whether you need a plastic water bottle giveaways for a fun run or a vacuum insulated travel mug for client gifts, we can customize the product to fit your brand. We have a wide variety of options, many of which allow for two-sided imprints to really get your name out there. Wine Glasses and Pint Glasses are perfect for non-profit events as they allow the event branding on one-side and a sponsor’s brand on the other. When selecting a travel coffee mug or water bottle, insulation is important. Foam insulation is less expensive and doesn’t hold heat for as long. Vacuum insulation is the best and can keep liquids hot up to 12 hours. We have many options similar to the Yeti and S’well brands which work great! There are a ton of ceramic mug styles which can be overwhelming. We take into account the shape of your logo, your logo colors and the attitude of your brand when helping you pick the right fit. Don’t overwhelm the design with contact information. When drinkware is used as a higher end gift, it’s important to not make it seem too much like an advertisement. Keep contact information to a minimum or consider leaving it off altogether. I know I can count on Promotional Concepts to successfully source all of our promotional swag needs. They go above and beyond when getting us good quality products at a reasonable price, and we have really enjoyed working with their team to come up with fun and exciting new ideas!